Sports Rendezvous: Ahmed: Musa From Russia to Leicester and back for record-breaking Super Eagles star. Ahmed: Musa From Russia to Leicester and back for record-breaking Super Eagles star. Musa produced two virtuoso second-half finishes to keep the Super Eagles in the hunt for a place in the last 16 on Friday. 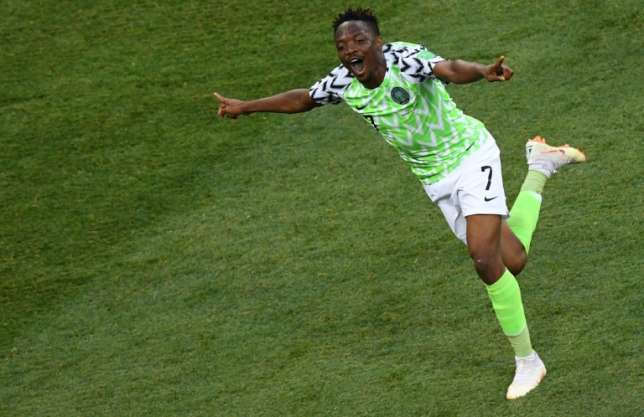 Leicester City's out-of-favour striker Ahmed Musa wrote himself into the World Cuprecord books by scoring twice to fire Nigeria to their first win in Russia against Iceland. The 25-year-old produced two virtuoso second-half finishes to keep the Super Eagles in the hunt for a place in the last 16 on Friday. They would guarantee progress with victory against Argentina in Saint Petersburg on Tuesday and even a draw could take them through if other results go their way.